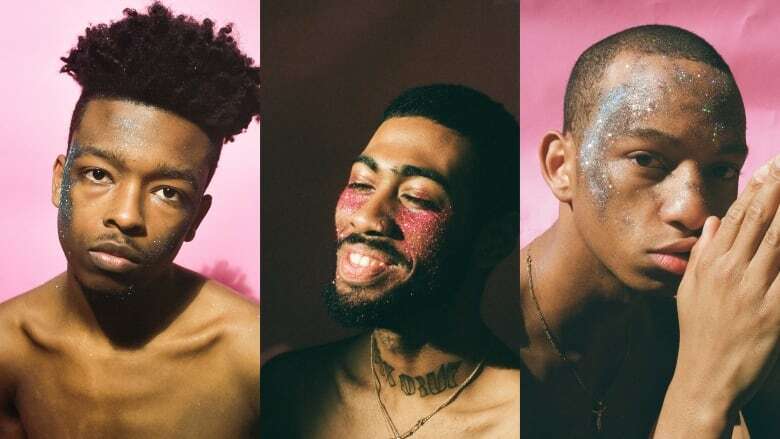 The 20-year-old's ongoing photo series Glitterboy is challenging people's notions of how Black men are "supposed" to be. 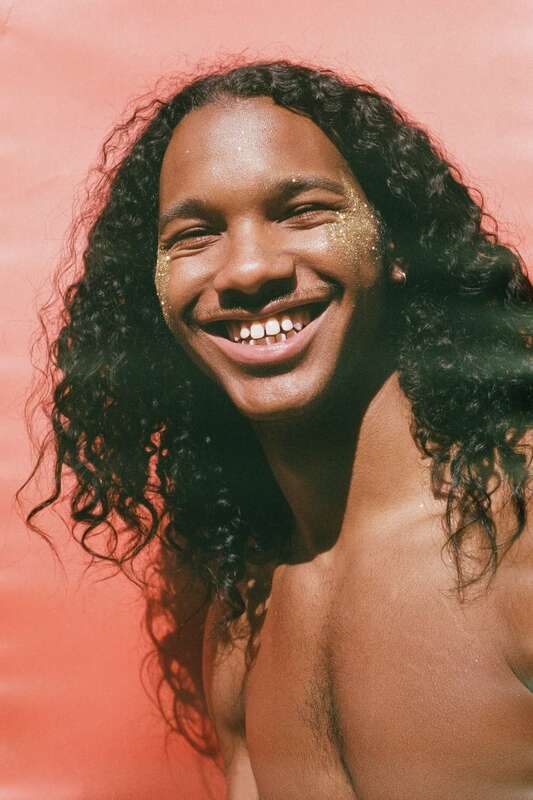 Glitterboy, the ongoing photo series by 20-year-old artist Quil Lemons, features portraits of young, Black men with metallic, sparkly flecks on their cheeks and foreheads. All shot against soft pink backdrops, the subjects express a range of moods and feelings. One named Jordun smiles from ear to ear, while Harley gazes coyly and Myles stares starkly at the viewer, as if to ask the question: why are you looking at me just because I'm wearing cosmetics? The answer to that has been jarringly mixed. 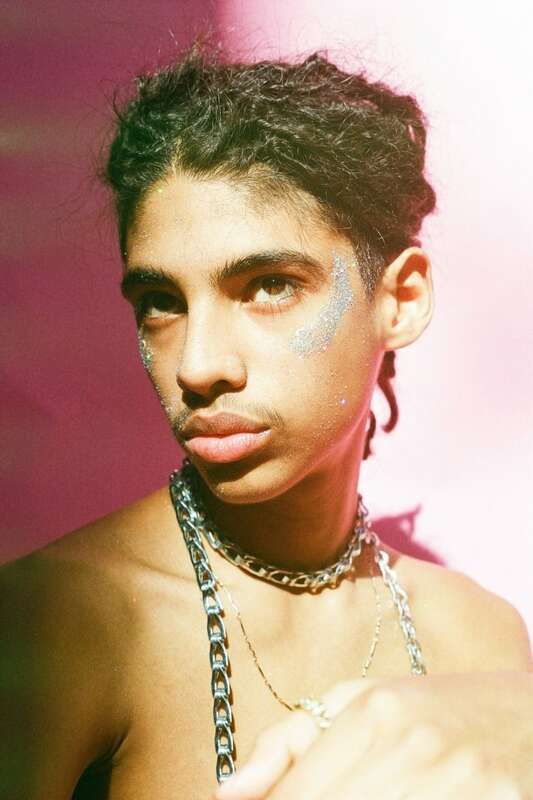 Lemons, who often wears glitter on his own cheeks ("it's cool when you see it in the sun," he says), first started posting images of Glitterboy on his Twitter and Instagram accounts in 2017. Since then, the reception has ranged from love — Vogue, Allure and i-D have all given glowing reviews — to anger. "People tried to drag me on Twitter saying things like, 'You are destroying the Black man,'" Lemons says at the downtown Toronto headquarters of 500px, a photo sharing company that is displaying the images poster-sized outside of their office building for the Contact Photography Festival. People also criticized Lemons' personal, sparkly aesthetic. "I remember walking past these older guys, and they were like, 'There aren't any more real men these days.'" That notion of what makes a "Black man" or "real man" frustrates Lemons. "I feel like being a Black male is always seen as a monolith," he says. "You get boxed into stereotypes — you have to be a gangster, or a macho man with no feelings." Challenging those fixed yet false notions through Glitterboy appeals to Lemons. "I just kind of want to throw away the boxes," he says. "I want to show that Black men can be feminine. Because there is actually no definition of what it means to be a Black man — you just are Black, and you can express that however you want to." But Lemons says he didn't start the project to make a big cultural statement. "I went in thinking nothing," he says. "I was shooting for me, and shooting my friends. I was creating without considering the political and social ties to my identity. It wasn't until the work was out and people were looking at the photos that societal perceptions were attached." Instead of intentionally causing a stir, he was galvanized by Frank Ocean's 2016 music video for the song "Nikes", where the singer appears with glitter on his face. For Lemons, it was a rare, comforting instance of seeing of an American man of colour blur the gender boundaries. "These are issues I deal with personally," says Lemons. "I wanted to make something that someone else might look at and say: 'I'm also Black and queer. Oh my god, thank you for this.'" Critically, though, Lemons has never disclosed the sexual orientations of his subjects. It's left intentionally ambiguous. "I've been asked: 'So everyone here is queer? '," says Lemons. "And I'm like, 'No,' and they're like, 'Huh?' When I get asked that I actually think it's more of a question for the viewer: why would you automatically think that?" Another question left for the view is why gender-bending undertones might be acutely more uncomfortable when the subjects are Black. "I feel there is a lot more acceptable fluidity to men that aren't of colour from within their communities," says Lemons. "As a Black community, we're only now just having the lexicon to talk about queerness. It's still very taboo." Lemons finds that taboo vexing. "The Black community has been trying to create unity, and to uplift themselves ever since slavery," he says. "There would be more unity if we didn't just negate a whole facet of the community." But he also sees it as an important place to start a conversation. "It gives me the opportunity to ask, 'Why are you so uncomfortable with queer identity when it's been around forever?'" Not that Lemons hopes that his work is only seen, discussed and debated by people of colour or the queer community. He hopes that his art has a broader effect as well, influencing how Black men are seen across cultures. "I want people to see us as nuanced and layered," he says. "We all have different layers. I hope it gives people a new perspective." Matthew Hague is a Toronto-based writer. His stories on art, culture and design have appeared in the Globe and Mail, Toronto Life and other publications.